These earrings will certainly turn heads when worn. 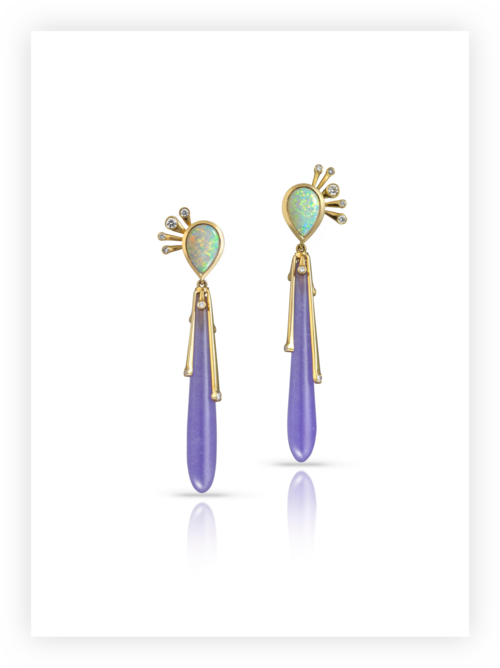 They are made out of 18K yellow gold, along with diamonds, jade and opals, what a combination. These earrings are a limited edition of three. It is definitely a unique statement piece, capturing the colours and movement of summer. Wear it with T-shirt and jeans or a cocktail dress, you can never go wrong with these earrings! 18K yellow gold with diamonds, jade and opals. All LeSter products can be customised, you can choose the colour the metal you would like would like to use, the texture, and the stones you would like to incorporate. Please send us a message hello@curated-crowd.com, and we will get in touch as soon as possible.